A fairy or færie (Old English spelling) is a supposed magical being that flies in the air. They are usually depicted as small girls or women. 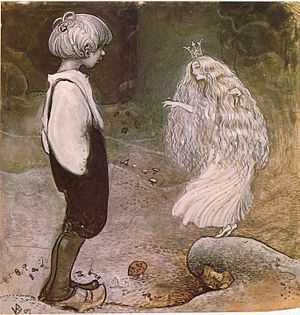 Some færies have certain jobs, such as the Tooth fairy, who gives money or treats under the pillow of small children who have had a tooth fall out. A fairy tale is a story with a plot involving fairies. These stories are usually for children. 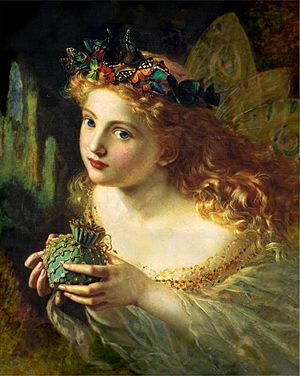 Fairies can also be found in folklore, for instance, in Ireland and Scotland, fairies are still held as creatures that were defeated by the human race thousands of years ago and now live in caverns in the world of faerie. These mystical creatures are believed to be made after a kind of angel. Fairies come up in many fictional books such as "Peter Pan" and "The Spiderwick Chronicles". Faie became Modern English fay. 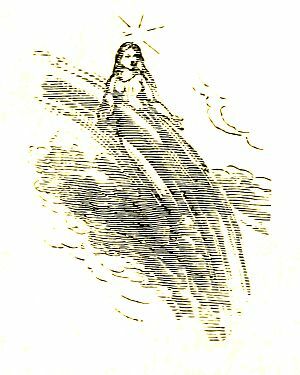 Faierie became fairy, but with that spelling now almost exclusively referring to one of the legendary people, with the same meaning as fay. 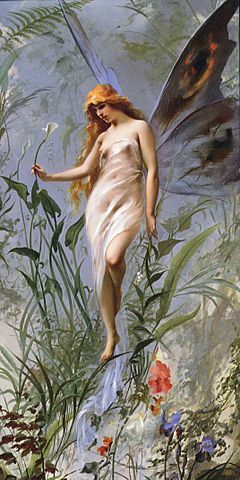 The word "fairy" was used to represent an illusion, or enchantment; the land of the Faes; collectively the inhabitants thereof; or an individual such as a fairy knight. Fairy Facts for Kids. Kiddle Encyclopedia.